Since the fall of 2017, Sravasti Abbey has been engaged with hearings on our county’s public process to permit a silicon smelter in the town of Newport, WA just 11 miles from the Abbey. We thought it would be good to share this news with our friends. In 2016, a Canadian company—HiTestSands— announced plans to build a $325 million, 40-acre silicon smelter in eastern Washington, eventually purchasing 192-acres for the project in Newport, Washington (population 2,118). The site boundary is less than one-quarter mile from residential properties. 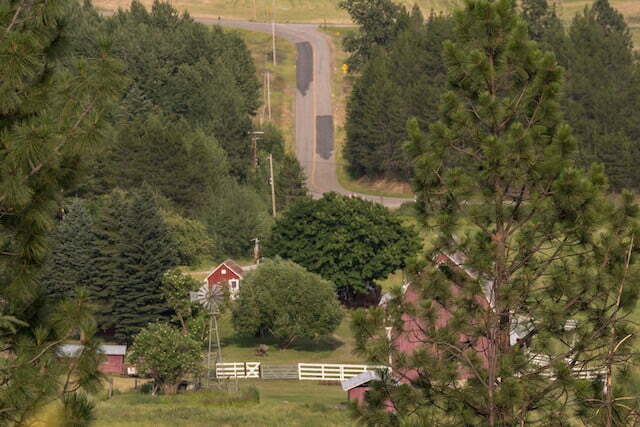 It is close to schools, medical centers, and the Newport, WA and Oldtown, ID business districts. State and local officials have been enthusiastic. They see the smelter as a revenue-producer for our economically depressed area. Residents and ecologists—including the Sravasti Abbey community and the Kalispel Tribe of Indians—have another perspective. We are deeply concerned about the potential degradation of air quality, excessive use of water, and overall environmental hazard to our pristine forests and waterways and the people who live and visit here. While HiTestSands’ proposal claims to use state-of the art technology to minimize environmental hazards, research into the proposed project—and existing ones like it—paints another picture. It’s possible—even likely—that smelter production and emissions would create a consistent haze and emit toxins that can sicken people and ruin the clean air and natural beauty of our region. The Abbey joins with the Kalispel Tribe of Indians, the Upper Columbia United Tribes, Citizens Against Newport Silicon Smelter, and others to oppose the smelter project. The following is an open letter to Washington officials, abridged from several such letters submitted by Sravasti Abbey. We write today on behalf of all the monastics of Sravasti Abbey, a Buddhist center of learning and practice located near Newport, Washington and in close proximity to the many communities in eastern Washington and northern Idaho affected by the HiTestSand silicon smelter proposed for Pend Oreille County. After months of attending meetings, reading, researching, and asking questions, we are joining with the many voices in Newport, Pend Oreille County, Bonner County, the Kalispel Tribe of Indians and others who are opposed to the proposed HiTestSand silicon smelter. We who live in Pend Oreille County live in a place of beauty. Families with deep roots and families who are newcomers live here seeking harmony with nature and with their neighbors. A 40-acre industrial plant with its pollution, noise, lighting, and traffic is an affront to the values we hold most dear. We appreciate the need for economic development in a county with 6.4 percent unemployment. However, the attractiveness of expanded employment does not outweigh the long-term impact of the silicon smelter on our environment, health, and culture. By its nature, the smelter will emit carbon monoxide, carbon dioxide, nitrogen oxide, sulfur dioxide, and silica dust. These substances are known to contribute to acid rain and associated human health issues. We are concerned about the smelter’s impact on indigenous culture, especially our neighbor, the Kalispel Tribe, which is renewing itself following decades of disenfranchisement. The smelter poses a direct threat to the health of their children and to their future generations. From a global perspective, the silicon smelter will become one more contributor to greenhouse gases accelerating the onset of climate change. Emissions data recently disclosed in HiTestSand’s Draft PSD Modeling state that the smelter would generate 320,000 tons of greenhouse gases, 760 tons of sulfur dioxide, and 700 tons of nitrogen oxides each year. This is roughly equivalent to the amount of greenhouse gases produced by 65,000 cars driving 11,000 miles each through the streets of Newport per year, and the amount of sulfur dioxide generated by burning 165,000 woodstoves continuously for 365 days per year on one acre. We are deeply concerned about the water needed for this industry. At the Sept. 11, 2017, meeting in the Newport City Council Chambers we heard that 300 gallons of water per day would be needed for the proposed smelter. Later estimates were reported to be about 8,000 gallons per day.In January 2018, we learned the company had requested 240,000 gallons of water per day from City of Newport. The request was denied, but it is a startling contrast from the earlier request. Where will the water come from? The property that HiTestSand has purchased for the proposed smelter straddles the Little Spokane and the Pend Oreille watersheds. The Little Spokane watershed is already an over-allocated water system that has to go on water rationing at certain times of the year. Truck transportation of raw materials is also an area of concern, even though the actual number of delivery vehicles per day has come under dispute. HiTestSand estimates daily materials delivery at 37 trucks per day. This will impact the City of Newport in the form of noise and fossil fuel pollution, and wear and tear on the highways and Newport’s roads. Blue gem coal needed for the smelting process will be brought in by rail. The transport of coal continues to be hazardous and accidents are well documented. An Assessment of the Health and Safety Implications of Coal Transport lists the serious risks in detail. The report documents how trains, trucks, and marine vessels hauling coal release toxic air pollutants, including nitrogen oxide and particulate matter into the air, primarily through diesel exhaust. Nitrogen oxides and PM2.5 are linked to stunted lung development and hospital admissions for potentially fatal cardiac rhythm disturbances. Diesel particulate matter that is less than 2.5 microns in size, is emitted by coal trains increasing the probability of heart attacks, ischemic heart diseases, disturbances of heart rhythm, and congestive heart failure. In addition, some of the coal dust that leaves the trains will enter the surface stream system, degrading water quality. In summary, as strong supporters of the 2015 Paris Agreement on climate change, we oppose industrial expansion, which adds to the misery of living beings. Everyone at Sravasti Abbey cares about the future of Pend Orville County and our neighbors, as well as the future of all beings on our planet. We raise our voices in strong opposition to the HiTestSand silicon smelter proposal. Read detailed information on the Newport smelter proposal and correspondence with county commissioners is on the Pend Oreille County website. Read Sravasti Abbey’s letter to the Kalispel Tribe and the letter to Pend Oreille County Commissioners. Read what the Kalispel Tribe of Indians natural resources division has to say about it .